The Moscow Institute of Physics and Technology welcomes high school students to take part in the programming boot camp Moscow Workshops Juniors. According to the results of the introductory contest the participants are divided into divisions depending on their skill level. Participants can choose the most interesting topics and make an appropriate training program. If a participant finds the curriculum too simple or difficult, he can change division. For the first time Moscow Workshops Juniors sets an English-speaking group up in 2019. 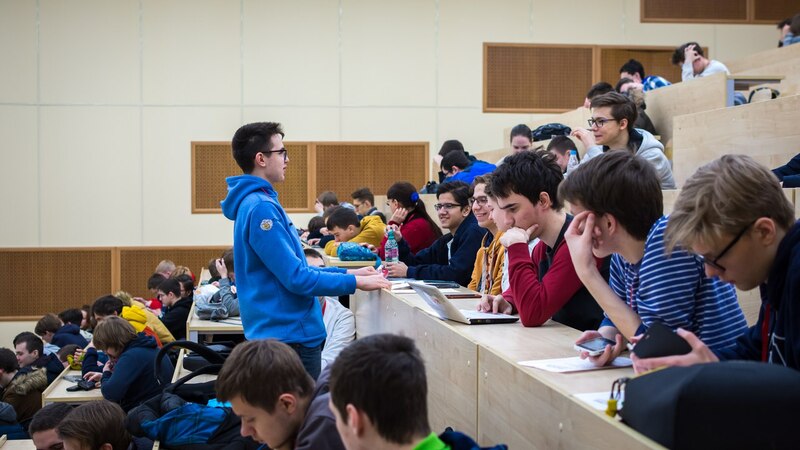 March 4, 2019, in the MIPT Concert Hall we will celebrate the anniversary of the Winter Computer Camp, a camp for high school students, which provides an opportunity to prepare for the IOI and other IT-contests. Alumni of the first Camp enrollment have already graduated from universities and many have achieved outstanding success in their careers and businesses. They will share their stories to inspire new participants to strive for heights. If you are a graduate of the winter camp of any set, we look forward to seeing you at MIPT on March 4, email us at zksh-team@phystech.edu. At the celebration, we will show a retrospective of the Winter Computer Camp, share with you the results of ten years of work and our plans for the future. Representatives of companies that support Winter Computer Camp, - Yandex and Mail.Ru Group, will take part in the event, there will be held buffet table and an entertainment program. On this day, the Winter Computer School will be officially announced to be named as Moscow Workshops Juniors, thus the camp will be the first step of the international educational program Moscow Workshops ICPC to prepare for ICPC and other programming contests. March 4, 2019 will also be the founding day of the Moscow Workshops Alumni community. During the six years of the project, more than 2,000 students from 55 countries took part in it. This is a unique community of the strongest young IT-specialists, many of whom have reached the heights of the ICPC and other global programming competitions, and it is important for us to keep the opportunity for them keep in touch. To pass qualifying online tours, its format is close to the Olympiad in Informatics. The ranking of the participants is made according to the results of four rounds. The selection rules can be found by the link. And you can try the trial Round. You will get the login and password after the registration via email, also you can see them on this page. We can host the coach/accompanying person of the participants (requires coordination with the organizing committee). Meals, accomodation and participating in official events will cost 350$.